Royal Navy International Air Day 2019 Airshow Display Schedule - Military Airshows in the UK - Timetable, Hotel Accommodation. Yeovilton was commisioned in 1939 as HMS Heron. 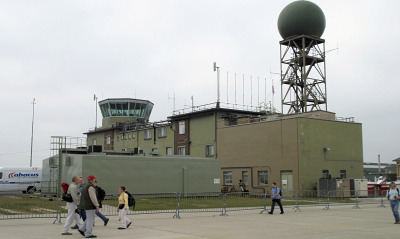 During the Second World War it was used as a fighter training school for the FAA (Fleet Air Arm), and as an occasional shore base for disembarked frontline squadrons. Aircraft seen here during World War 2 include the Master, Roc, Sea Gladiator, Sea Hurricane, Spitfire, Fulmar, Martlet, and Firefly. After the War, Yeovilton expanded considerably when it became shore base for the fleet's all-weather fighters with the Sea Vixen and later the Phantom. In 1972, Yeovilton's involvement with fixed-winged aviation came to a temporary close with the only resident aircraft based here being a number of Commando helicopter squadrons. However in 1979 the first STOVL (Short Take-Off and Vertical Landing) Sea Harrier FRS1 aircraft arrived at Yeovilton together with Sea King Commando helicopters. The Sea Harrier FRS.1 was replaced by the much improved Sea Harrier FA2 in 1993 which was eventually withdrawn from service in 2006. 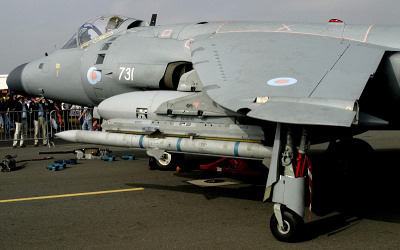 The Royal Navy Fleet Air Arm and the Royal Air Force then shared the Harrier GR9, which was based at RAF Cottesmore, until all Harrier operations ceased in 2010 after the Strategic Defence and Security Review. The Harrier is to be replaced by the F-35B 'Lightning II' Joint Strike Fighter which will operate from the new Queen Elizabeth class carriers from 2018. The RAF and Fleet Air Arm will share these aircraft which will be based at RAF Marham or deployed on the carriers and operated by Fleet Air Arm & RAF pilots. Today, RNAS Yeovilton is home to the Lynx HMA.8 (Operational on Frigates and Destroyers), Wildcat HMA.2 , Merlin HC.3 (Royal Marines Commando Support) and the Wildcat AH.1. (Royal Marines Commando Support). In October 2015, the Army's Wildcat AH.1 was merged with Yeovilton's Wildcats so that the 62 UK military Wildcats on order will all operate from RNAS Yeovilton. It is also home to 'A' Flight with the Hawk T.1, 727 Naval Air Squadron with the Tutor T.1, and the Royal Navy Historic Flight. The Royal Navy Historic Flight (RNHF) was established at RNAS Yeovilton in 1972 and became the home for a number of aircraft that had been donated to the Royal Navy over more than a decade. The RNHF consists of the Fairey Swordfish, Hawker Sea Fury, Sea Hawk, and Chipmunk T.10. More information on the RNHF can be found here. In 2019, the 'RNAS Yeoviton International Air Day' was renamed the 'Royal Navy International Air Day'. As the RNAS Culdrose Air Day saw its last show in 2016 then Yeovilton renamed their airshow to reflect that it was now the only Royal Navy Airshow. The Royal Navy International Air Day takes place at RNAS Yeovilton in Somerset which is home to the Fleet Air Arm's helicopters that deploy aboard the Royal Navy's ships. Formerly called the 'RNAS Yeovilton International Air Day', it has changed its name to the 'Royal Navy International Air Day' as it is now the only Royal Navy airshow with the cancellation of the RNAS Culdrose Air Day. There is also a Fleet Air Arm Museum at RNAS Yeovilton which has a collection of about 60 different historic aircraft as well as the Royal Navy Historic flight. Yeovilton hosts a popular Air Day in July which attracts about 35,000 visitors, and includes significant UK/Foreign military participation and support from the world's leading aerospace companies. Please check with official RNAS Yeovilton Air Day website for ticket prices and booking. Saturday 13 July - Timings to be announced.